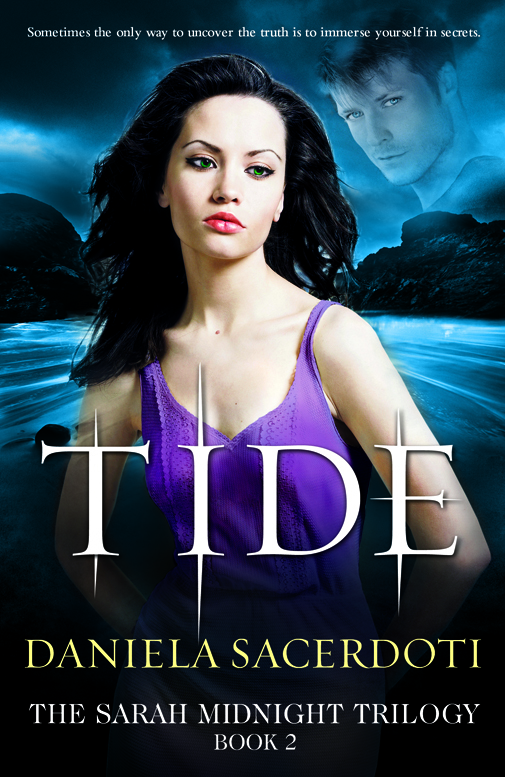 Today, as part of the blog tour for Daniela Sacerdoti’s Tide, I am sharing an outake form the book with you. This is the second book in the Sarah Midnight Trilogy and I cannot wait to get round to my copy, I loved the first, Dreams, and you can read my review of it here. The next stop of the blog tour is at Mr Ripley’s Enchanted Books next week! Deceive the hope I never had? The journey from Italy to Edinburgh took a few hours, but after the vision I had on the plane, of Sarah kneeling in defeat and her life being taken away, it felt like an eternity. I saw threats everywhere, all around me. Every traveller could be part of the Valaya, every person could be a Surari – the businessman who kept watching me from the corner of his eye, the flight attendant, the taxi driver, even the mother with the pram – everything seemed a hidden threat to me. I remember when the world seemed so full of hope, so full of promise to me. A place of danger, yes, like for all the Secret heirs – I had no illusion about that, having had dreams since I was thirteen. Still, I felt that happiness was always there for the taking. Not even being a Dreamer, the hardest burden that an heir has to carry, was enough to make me lose hope, or want to cower. I remember hearing of young Dreamers being broken and damaged by the gift – but not me. I took it in my stride. The world of my dreams was something else from the world I lived in, and as long as I kept them separate in my head, it didn’t affect me that much. I was pretty, I was gifted, I had many friends and a few boyfriends, and I was the apple of my parents’ eyes. I never thought that life, as I knew it then, would be over. I never thought that I’d be standing in front of a silent cottage with black windows, overgrowing with weeds, on a cold, lonely winter night. Hearing my breath coming in and going out in little frozen puffs, watching for rustling leaves, listening for the crunch of frosty grass, or a heartbeat that wasn’t mine. I was so far from the life I’d shared with Harry in London, and the brief one I’d found in the Italian Alps. Now I’d arrived here at this little house that might or might not be Sean’s. I looked for Sean’s location by scrying on a map of Edinburgh. Scrying is not the most reliable of sources at the best of times, and I’m rubbish at witchcraft in general. I wish I’d paid more attention when my mum was trying to teach me. Still, the necklace I used, the little amber angel on a silver chain, had circled frantically over this spot during the scrying, and now as I walk down the path it starts vibrating ever so slightly against my neck. Sean has definitely been here, at some stage. But is he still living here? I make my way inside, into the dark. I can open any door, locked as it might be; I was taught by the best, after all. I bet Sean couldn’t have imagined that one day I would use the skill he taught me to break into his own place. A quick survey of the house reveals I’m on my own. There are signs of someone living here, though: a few cans in the kitchen, scattered clothes. It’s a man – shaving foam in the bathroom. It must be Sean. Yes. Yes, it is Sean. The T-shirt draped on one of the sofas; “Christchurch Jazz Festival 2008”, it reads. I remember the days of the festival. I remember us four – Harry and I, Sean and Mary Anne – drinking beer outside, and listening to band after band into the small hours of the morning. I shiver. It’s cold in here. I light the fire with the peat that’s sitting in the basket beside the fireplace, and wait. The warmth and the flickering light relax me, for the first time in . . . I can’t even remember. I’m about to see Sean again. When I hear the keys in the door, I know it’s him. I feel his presence at once, like a sort of psychic scent. It doesn’t work with everyone. I can only feel people I’m attuned to, people who are very close to me. I spring on my feet and run down the corridor with the peeling wallpaper. In the feeble light of the table lamp, I see him standing in the doorway – tense, wary, a dagger in his hand. And then, he sees me, and the joy on his face looks a little bit like pain. Like a shipwreck survivor who, by the time he’s rescued, has seen too much already to fully rejoice in his salvation. Then we’re in each other’s arms, and neither of us wants to be the one who pulls away. At least now we’re together. There’s two of us, two of Harry’s family. The ones who aren’t dead. Yet. I must convince Sean to do something, something more than just waiting to be picked off. In my bag I have Harry’s book, and the letter. I’m not sure if they’re anything to go by – I can’t see what clue they offer – but maybe together we can figure it out. I desperately want Sarah to be with us in this. I want her to survive. She’s the only bit of Harry I have left – his cousin. We share the same surname. But if Sean doesn’t convince her to join us, we can’t afford to spend all our energy protecting her. I must make Sean see that, as painful as it is. I watch Sean sleep, a deep, undisturbed sleep you wouldn’t expect from a chronic insomniac. The thought that my presence finally allows him to rest after so long fills me with tenderness. Like someone needs me again, not just as an heir, but as myself. How different from Harry he looks: same blonde hair, but where Harry’s features were delicate, there’s something strong about Sean’s, something unyielding. The way he said Sarah’s name, the way he reacted when I told him of my vision, made me stop in my tracks. I think I saw something in his eyes, I heard something in his voice that was not just affection, or born out of a sense of duty. I think he’s in love with Sarah. I wonder if Sarah reciprocates, in spite of the anger she feels now. I wonder if I’ll ever, ever feel like that again. My answer would be no, that’s impossible, but the pomegranate’s prediction said otherwise. Can there be life after all this? Can the world be a place of hope again? For a moment as I sit at the window watching the pines sway against the winter sky, with Sean asleep in perfect peace on his bed, I think that maybe, maybe there is an after. If we’re still alive when this is finished, that is.